The transcription factor NF-κB has been well recognized as a pivotal regulator of inflammation in rheumatoid arthritis (RA), but recent developments revealed a broad involvement of NF-κB in other aspects of RA pathology, including development of T helper 1 responses, activation, abnormal apoptosis and proliferation of RA fibroblast-like synovial cells, and differentiation and activation of bone resorbing activity of osteoclasts. In agreement with this, studies in animal models of RA have demonstrated the high therapeutic efficacy of specific inhibitors of NF-κB pathway, indicating the feasibility of anti-NF-κB therapy for human disease. Chronic inflammation perpetuates and amplifies itself through the numerous autocrine and paracrine loops of cytokines, acting on the cells within the lesion. The vicious circle can be broken either by neutralizing the biological activities of extracellular inflammatory mediators or by inhibiting cytokine production. The pattern of gene expression is controlled by transcription factors, which relay into the nucleus signals emanating from the cytoplasmic membrane. In the nucleus, transcription factors selectively bind their cognate sites in the regulatory elements of targeted genes and activate or repress transcription. It appears that the complexity of inflammatory pathways is significantly reduced on the level of transcription factors. Whereas the cell within the inflammatory lesion is subjected to many dozens, perhaps hundreds, of extracellular stimuli, only a handful of inducible transcription factors, including AP-1, C/EBPs, STATs, NF-AT, and NF-κB, appear to play a major role in the regulation of inflammatory genes. This suggests that neutralization of these transcription factors may provide an efficacious therapeutic strategy. A pivotal role for the transcription factor NF-κB in regulation of inflammation has been well recognized [1,2]. I attempted, in a recent general article, to summarize the latest developments in the field and to discuss the feasibility of anti-NF-κB therapy for chronic inflammation . The present review focuses on the role of NF-κB in the particular features of RA pathology. NF-κB is a collective name for dimeric transcription factors comprised of the Rel family of proteins that include RelA (p65), c-Rel, RelB, NF-κB1 (p50), and NF-κB2 (p52) . The most abundant form found in stimulated cells is the RelA/NF-κB1 (p65/p50) heterodimer, often referred to as a 'classic' NF-κB. In unstimulated cells, NF-κB resides in the cytoplasm in a latent form, and must translocate to the nucleus to function. The cytoplasmic retention of NF-κB is provided by its interaction with inhibitory proteins known as IκB. Stimulation leads to a phosphorylation-targeted proteasomal degradation of IκB, allowing the 'active' NF-κB to enter the nucleus and initiate transcription. The signal-induced IκB processing involves the consecutive steps of IκB phosphorylation, ubiquitination, and proteasomal degradation, which are controlled by three large multiprotein complexes; namely, IκB kinase (IKK), or signal-some, IκB ubiquitin ligase, and 26S proteasome . The IκB ubiquitin ligase and 26S proteasome are considered mostly constitutively active, while IKK activity is rapidly induced in response to stimulation. The core components of the signalsome include the catalytic subunits IKKα/IKK-1 and IKKβ/IKK-2, and a scaffold protein IKKκ/NEMO that links the catalytic kinase subunits with the upstream activators. Both IKKα and IKKβ can phosphorylate IκB in vitro, but knockout studies indicate that IKKβ has a pivotal role in cytokine-inducible activation of NF-κB . In addition to the spatial control of NF-κB function, the ability of nuclear NF-κB to initiate transcription is regulated by interactions with numerous transcriptional coactivators and basal transcriptional machinery. The pathways controlling NF-κB nuclear translocation and its transcription function are regulated independently, but act in synergy in the activation of NF-κB-dependent gene expression . NF-κB can be activated by a variety of pathogenic stimuli, including bacterial products and viral proteins, cytokines, growth factors, radiation, ischemia/reperfusion, and oxidative stress. The coordinated activation of NF-κB that occurs in almost every cell type involved in inflammatory response, including neutrophils, macrophages, lymphocytes, and endothelial, epithelial, and mesenchymal cells, is an integral part of the defensive response to pathogens and stress. The activation of NF-κB is required to induce expression of diverse inflammatory and immune response mediators. More than 150 NF-κB responsive genes have been identified, among them cytokines, chemokines, cell adhesion molecules, and growth factors . A few examples of inducers and targets of NF-κB are presented in Figure 1. It is worth noting that the list of inducers and targets of NF-κB almost perfectly matches the list of pivotal mediators of RA pathology. 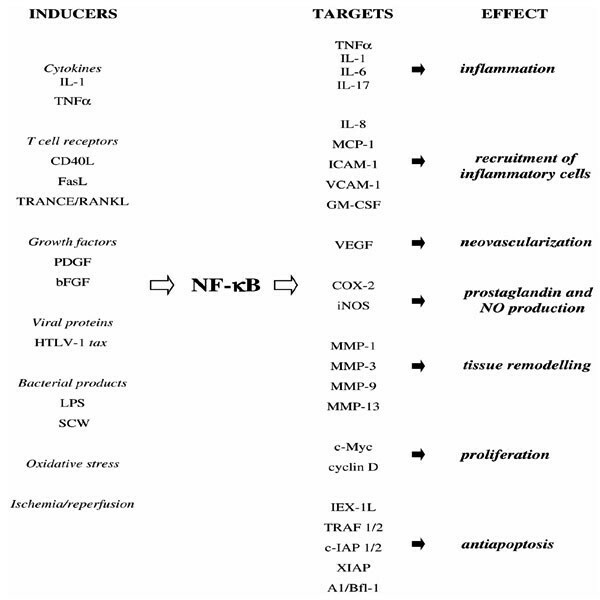 Inducers and targets of NF-κB. bFGF, Basic fibroblast growth factor; CD40L, CD40 ligand; COX-2, cyclooxygenase-2; GM-CSF, granulocyte-macrophage colony-stimulating factor; iNOS, inducible nitric oxide synthetase; LPS, lipopolysaccharide; MCP-1, monocyte chemoattractant protein-1; RANKL, receptor activator of NF-κB ligand; TRANCE, TNF-related activation-induced cytokine; VEGF, vascular endothelial growth factor. Activated NF-κB has been detected in human synovial tissue on the early stage of joint inflammation , as well as in specimens obtained at the late stages of the disease. Analyses of nuclear extracts from synovial explants revealed the presence of increased NF-κB DNA binding activity in RA patients, but not in osteoarthritis patients . Immunohistochemical studies detected nuclear RelA (p65) and NF-κB1 (p50) mostly in RA endothelium and synovial lining, particularly in CD14-positive cells, and no staining in the normal synovium . Immunostaining with antibodies against the 'active' (dissociated from IκB) NF-κB similarly revealed the presence of active NF-κB in the nuclei of macrophage-like synoviocytes in synovial lining and in vascular endothelium. The active NF-κB was found in both RA and osteoarthritis samples, although the pattern was different: patients with acute RA more commonly showed vessel staining and, conversely, showed less frequent staining of the synovial lining as compared with osteoarthritis patients . Miyazawa et al used an alternative approach with a NF-κB reporter gene construct to analyze NF-κB-dependent transcription in single clones of primary RA fibroblast-like synovial cells (FLS) in vitro. Constitutively active NF-κB was detected in some of the clones and, noteworthy, these clones spontaneously produced large amounts of IL-6 . These findings combine to provide compelling evidence that NF-κB activation is a common feature of human RA synovium. Activation of NF-κB has also been detected in different animal models of RA, including adjuvant arthritis in rats , pristane-induced  and streptococcal cell wall (SCW)-induced arthritis in rats [14,15], and collagen-induced arthritis (CIA) in mice . Initiation of chronic inflammation in RA is associated with development of an autoimmune response that progresses to a sustained, self-perpetuated inflammation. Experimental evidence suggests that NF-κB activation plays a pivotal role both at the stage of initiation and the stage of perpetuation of chronic inflammation in RA. The interaction of the antigen presenting cell (APC) and T cell causes NF-κB activation in both cell types. NF-κB activation is triggered in T cells by the engagement of the T cell receptor and the CD28 receptor with their ligands, MHC class II, and the costimulatory molecules CD80 and CD86 presented by APCs. The T cell receptor and CD28 synergize in induction of the NF-κB-dependent genes required for T cell activation and proliferation, such as IL-2, IL-2 receptor (IL-2R), and IFNγ [17,18]. Activated T cells, in turn, elicit NF-κB activation in APCs. The molecules of the tumor necrosis factor (TNF) superfamily, CD40 ligand and TRANCE (TNF-related activation-induced cytokine) (also known as RANKL [receptor activator of NF-κB ligand]) or ODF (osteoclast differentiation factor), are expressed by activated T cells. Their interaction with APC receptors CD40 and RANK induces NF-κB activation that promotes survival and augments the ability of the APC to stimulate T cell proliferation and activation, conceivably by upregulating the expression of NF-κB-dependent molecules MHC class II, CD80, and CD86 [19,20,21,22]. The importance of NF-κB activation in immune response was supported by the observations in knockout mice. Inactivation of RelB and NF-κB2 in relb-/- and nfkb2-/- caused an impairment of APC function. The loss of NF-κB1 and c-Rel in nfkb1-/- and rel-/- mice resulted in multiple defects in the activation of T and B cells, and weakened responses to pathogens . After activation, CD4+ T helper (Th) cells can differentiate into Th1 or Th2 effector subsets. These two types of cells produce distinct profiles of cytokines and regulate different immune responses: Th1 (IFNγ and IL-12 dominant) cells mediate cellular immunity and activate macrophages, and they are considered proinflammatory; Th2 (IL-4 and IL-5 dominant) cells, which potentiate antiparasite and humoral immunity, and inhibit macrophage activation, are considered anti-inflammatory. As NF-κB controls the expression of Th1 cytokines IL-2, IFNγ, and IL-12, activation of NF-κB should facilitate Th1 subset development. Indeed, transgenic mice expressing, in the T lineage, an inhibitor of NF-κB (a nondegradable mutant of IκBα, also called 'super-repressor' IκBα [srIκBα]), had weakened Th1 and enhanced Th2 responses [24,25]. T cells from transgenic mice expressing Rac2, an upstream NF-κB activator, accordingly developed Th1 type responses . Secreted products of activated T cells and direct cell-cell contacts induce activation of macrophages, the major producers of inflammatory cytokines in RA synovium. NF-κB controls the expression of cytokines IL-1β and TNFα, the essential mediators of inflammation in RA. TNFα and IL-1 are potent inducers of NF-κB activation, suggesting an interdependence of persistent NF-κB activation and sustained levels of IL-1 and TNFα. Indeed, expression of srIκBα abrogated the induction of IL-1β and TNFα in human macrophages and primary FLS [14,27]. A recent study by Aupperle et al indicates that, in RA FLS, IKKβ/IKK-2 is the principal kinase in activation of NF-κB in response to IL-1 and TNFα. Expression of a DN mutant form of IKK-2 inhibited cytokine-inducible activation of NF-κB and abrogated synthesis of IL-6 and IL-8, as well as expression of ICAM-1 and collagenase-1. In contrast, the DN IKKα/IKK-1 had no effect . The notion that IKKβ/IKK-2 is the key convergence pathway for cytokine-induced NF-κB activation is consistent with results of genetic studies in IKK knockout mice . It is worthy of note that suppression of NF-κB inhibited expression of many proinflammatory molecules, including IL-1, TNFα, IL-6, IL-8, ICAM-1 and VCAM-1, but had little, if any, effect on the expression of anti-inflammatory cytokines IL-10 and IL-1 receptor antagonist [14,29,30,31]. This suggests that NF-κB activation facilitates the impaired balance of proinflammatory and anti-inflammatory molecules in the arthritic joint. Normal synovium is a delicate tissue lining the joint capsule but, in RA, the synovium transforms into an aggressive, tumor-like structure called pannus, which invades and erodes the joint. Experimental evidence suggests that NF-κB activation may facilitate synovial hyperplasia by promoting proliferation and inhibiting apoptosis of RA FLS. NF-κB serves as a positive regulator of cell growth in myoblasts and fibroblasts by inducing the expression of c-Myc and cyclin D1, proteins required for cell cycle progression [32,33,34]. Our studies in primary rat FLS have shown that stimulation with platelet-derived growth factor (PDGF) and basic fibroblast growth factor induced NF-κB activation, which was required for induction of c-Myc and DNA synthesis  (J Romashkova, S Makarov, unpublished observations). In contrast, the mitogenic activity of insulin-like growth factor-1, which did not activate NF-κB, was not influenced by NF-κB inhibitors (J Romashkova, S Makarov, unpublished observations). Another function of NF-κB in mitogenic signaling in FLS is to protect cells against cytotoxicity of c-Myc. Although c-Myc is required for proliferation, it causes cell death unless certain survival factors are provided. PDGF is one such factor that overcomes the pro-apoptotic proclivity of c-Myc. We found that blocking NF-κB activation abrogated the protective effect of PDGF, indicating that, in PDGF signaling, NF-κB transmits two signals: one is required for the induction of c-Myc; and the second is an anti-apoptotic signal that neutralizes c-Myc cytotoxicity, conceivably by inducing the expression of a protective gene (or multiple genes) . As c-Myc is heavily overexpressed in RA synovium, NF-κB activation may contribute to synovial hyperplasia by inhibiting c-Myc-induced apoptosis and promoting proliferation. A point of interest is that the pathway via which PDGF induced NF-κB activation involved phosphatidylinositol 3-kinase (PI(3)K) and protein kinase B/Akt (see later). As the PI(3)K/Akt pathway has been implicated in the pathogenesis of numerous human malignancies, this suggests that similar mechanisms may operate in the promotion of hyperplasia in RA and cancer. Many pro-apoptotic stimuli, including TNFα, radiation, and chemotherapy, induce NF-κB activation. NF-κB activation delivers, in most cell types, an anti-apoptotic signal that counteracts cell death. NF-κB suppression of apoptosis appears to be a transcriptional event since it activates expression of anti-apoptotic genes TRAF1 and TRAF2, c-IAP1 and c-IAP2, the Bcl-2 homologs A1/Bfl-1 and Bcl-xL, IEX-1, and XIAP (reviewed in ). In our studies, blocking NF-κB activation in primary rat SCW FLS strongly potentiated the cytotoxicity of TNFα and FasL. Consistent with this, administration of distinct inhibitors of NF-κB (proteasomal inhibitors and adenoviral gene transfer of srIκBα) in vivo resulted in accelerated apoptosis in joints of rats with pristane-induced and SCW-induced arthritis . These studies are in agreement with that published by Zhang et al, who observed that NF-κB activation was required to protect RA FLS against the cytotoxicity of TNFα in a human RA/SCID mouse model, presumably through induction of anti-apoptotic protein XIAP . These findings indicate an important role for NF-κB in protecting FLS against apoptosis in RA synovium, conceivably by inhibiting the cytotoxicity of TNFα and FasL. Because TNFα is a potent mitogen in RA FLS, NF-κB appears as a master switch determining whether TNFα exerts mitogenic or pro-apoptotic effects. Recent work from our laboratory and by other workers has, as already mentioned, established NF-κB as a target of the PI(3)/Akt pathway that has a prominent role in cell survival and proliferation in cancer. The PI(3)K/Akt pathway has been shown to mediate activation of NF-κB in response to a wide variety of stimuli, including PDGF , TNFα , IL-1 , bradykinin , and oncogenic H-Ras  and Her-2/neu . Akt-dependent NF-κB activation has been shown to mediate anti-apoptotic functions of PDGF  and Her-2/neu , and to inhibit cell death induced by deregulated c-myc , H-Ras , and TNFα . Precisely how Akt activates NF-κB-dependent transcription is a matter of debate. Several groups, including that of the present author, demonstrated an involvement of IKK, thus implicating IκB-dependent mechanisms [32,37,39,41,42], while results by other workers demonstrate IκB-independent mechanisms, in which Akt potentiates the transcriptional function of NF-κB [38,40]. It is possible that the mechanisms connecting Akt with NF-κB, as well as the contribution of NF-κB pathway in the anti-apoptotic function of Akt, are cell type and stimulus specific. A role for Akt in the pathogenesis of RA and the contribution of Akt to NF-κB activation in RA synovium are not known, but there is circumstantial evidence that this link may exist. The activity of the PI(3)K/Akt pathway is negatively regulated by the phosphatase PTEN, a tumor suppressor frequently inactivated in human malignancies  and in some autoimmune diseases, such as Cowden disease and Sjögren's syndrome . The importance of the PTEN-PI(3)K/Akt connection in autoimmune disease was demonstrated by observations in PTEN+/- heterozygous mice that exhibited defects in Fas-induced apoptosis and developed autoimmune disease , and in PI(3)K transgenic mice that developed strikingly similar pathology . Although PTEN mutations were not found in RA, the expression of PTEN is strikingly reduced in RA synovial lining , suggesting that deregulated PTEN may result in activation of the PI(3)K/Akt pathway and contribute to activation of NF-κB. The role of Akt and the Akt–NF-κB connection in RA clearly merits further investigation. FLS are considered the major effectors of RA joint destruction. Inflammatory milieu in the RA joint results in a highly invasive phenotype of RA FLS. Several lines of evidence suggest that NF-κB activation contributes to the destructive potential of RA FLS. First, NF-κB mediates transcriptional activation of several matrix metalloproteinases (MMP). The promoter of MMP-1 has a NF-κB binding site that is required for the induction of MMP-1 by IL-1β . Furthermore, NF-κB activation was found necessary for the induction of MMP-3, MMP-9, and MMP-13 expression [49,50,51]. Second, NF-κB activation is necessary for the induction of cyclooxygenase-2 and inducible nitric oxide synthetase, the enzymes that catalyze synthesis of proinflammatory prostaglandins and nitric oxide metabolites . Finally, NF-κB activation is required for the induction of vascular endothelial growth factor, an endothelial cell-specific mitogen and a pivotal regulator of angiogenesis in RA . Osteoclast is another cell type in which NF-κB activation may have a prominent role in RA joint destruction. Bone marrow-derived osteoclast precursors are recruited to RA synovium by elevated levels of NF-κB-dependent cytokines IL-1α and IL-1β, TNFα, IL-6, and IL-17 [53,54]. The contacts with activated T cells and osteoblast/stromal cells expressing high levels of TRANCE/RANKL/ODF promote osteoclast maturation and induce bone resorbing activity, while administration of osteoprotegrin, a soluble decoy receptor for RANKL, prevents osteoclast differentiation and precludes bone loss in animal arthritis [20,55]. The critical importance of NF-κB in bone turnover was underscored by the observations in double-knockout nfkb1-/-nfkb2-/- mice that develop osteopetrosis owing to accumulation of immature osteoclasts . Many conventional anti-inflammatory and anti-rheumatic drugs, including glucocorticoids, aspirin, sodium salicylate, sulfosalazine, and gold compounds, are inhibitors of NF-κB activation. The list of therapeutics that inhibit NF-κB also includes numerous natural and synthetic antioxidants, immunosuppressants, and natural plant compounds, suggesting that the ability to suppress NF-κB activation at least partially accounts for their therapeutic effects . This interpretation, however, is complicated by the fact that most of the conventional drugs are not very potent inhibitors of NF-κB, and that they can also affect other signaling pathways. More clear answers were obtained using animals with genetically inactivated NF-κB signaling. Inactivation of c-Rel and NF-κB1 in rel-/- and nfkb1-/- knockout mice rendered the animals refractory to development of CIA . Transgenic mice expressing srIκBα in the T lineage were similarly refractory to CIA . These genetic studies are in a good agreement with the experiments that utilized highly specific inhibitors of NF-κB. In our studies, liposomal delivery of NF-κB decoys (double-stranded oligonucleotides containing NF-κB binding sites) effectively prevented the recurrence of SCW arthritis in rats. Intriguingly, the suppression of arthritis was evident not only in the ipsilateral, treated joints, but also in the contralateral, untreated joints, indicating systemic effects of local anti-NF-κB therapy . Administration of NF-κB decoys in a similar study significantly reduced the severity of CIA in rats, and inhibited the production of IL-1 and TNFα within the joints . In a study by Palombella et al, a proteasomal inhibitor of IκB degradation afforded protection against SCW-induced arthritis in rat . Together, these animal studies strongly support the feasibility of using NF-κB inhibitors in RA. The efficacy of anti-NF-κB therapy in animal models of RA allows for optimism, but many questions remain to be answered. First, future therapeutic applications will require development of specific and potent inhibitors of the NF-κB pathway. Second, the safety of a long-term use of specific NF-κB inhibitors remains to be elucidated. The lessons from genetic studies revealed that basal NF-κB activity is required for normal development, particularly for protection of liver against apoptosis, and that inactivation of the NF-κB pathway may be associated with detrimental side effects (reviewed in ). One way to circumvent this problem is to target the components of NF-κB signaling that are required for cytokine-inducible activation of NF-κB, without interfering with basal NF-κB activity. One such approach has been recently described by May et al . The authors designed a peptide derived from IKKγ/NEMO to block the assembly of IKK signalsome. The peptide strongly suppressed cytokine-inducible NF-κB activation, but spared basal NF-κB activity. Using the cell-permeable inhibitory peptide in vivo afforded the suppression of inflammatory responses in animal models of peritonitis and ear edema. Another concern is that systemic suppression of NF-κB may impair defensive responses to pathogens. The unwanted effects of anti-NF-κB therapy can be diminished by targeting NF-κB inhibitors to certain tissues or cell types. In this regard, gene delivery of NF-κB inhibitors may have distinct advantages (reviewed in ). Local delivery should alleviate the possible side effects associated with systemic exposure and minimize the risk of general immunosuppression. This work was supported by National Institutes of Health Grants AR/AI 44564, 5-P60-AR30701-14 and AR/AI 44030, and by an Investigator Award from the Arthritis Foundation.